Are the winds of change taking over your outdoor living space expectations? As we change, so do our wants and needs. For instance, in the 90s when searching for homes, most buyers just “had to have” a master bath that included a garden tub and a separate enclosed shower. Today we often see those same homeowners upgrading to the larger all glass, enclosed walk-in shower mostly because they offer easier accessibility for everyone. 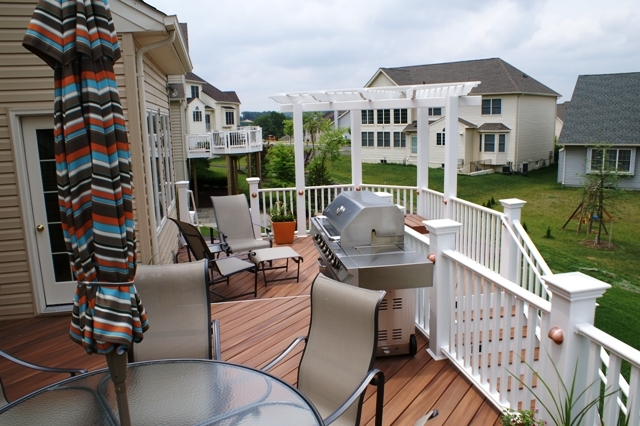 Archadeck of Central Maryland and Montgomery County, over the years, has seen the same sort of thing happen with many homeowners’ outdoor living space needs. Similarly, where a large open deck previously served your entertaining needs well for the kids’ birthday parties when they were younger or a backyard barbecue, now your outdoor living needs may be different. Perhaps your children are all grown up and out on their own or maybe you no longer need an open space, but prefer a covered space which provides protection from the elements and insects. With these changing needs in mind, converting your deck into a screened porch, or even your existing screened porch into an outdoor room (such as a 4-season room, or sunroom) may be the perfect solution and we can help. Deck-to-screened porch conversion: Your spacious deck provides an area for outdoor dining, relaxation and entertaining, so choosing to convert that deck into a screened porch simply upgrades that area for the same activities, but without the hassle of pesky insects or the dangers associated with the sun. As an added benefit, during times of inclement weather, a screened porch allows you to continue the fun on your protected porch. Just think about the last time a sudden spring shower dampened your outdoor event on your deck, ultimately driving you all back into the house just in time for the rain to stop. Now imagine that same event continuing while that quick shower comes and goes, without your outdoor party missing a beat because your outdoor living space is now covered and protected! 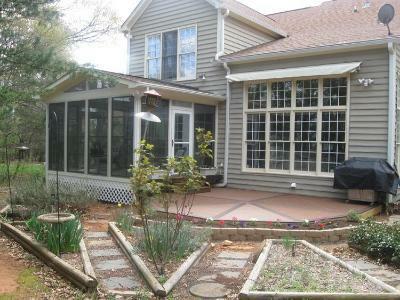 Screened porch-to-sunroom conversion: Your existing screened porch protects your outdoor events, but if you completely enclose that same space with glass windows and add a heating and/or air conditioning source, you will extend the livable area of your home as well as have an excellent space for entertaining. When you get down to the logistics of it, a sunroom, or interior room addition is like having a screened porch with walls and windows which can be used year-round after all! 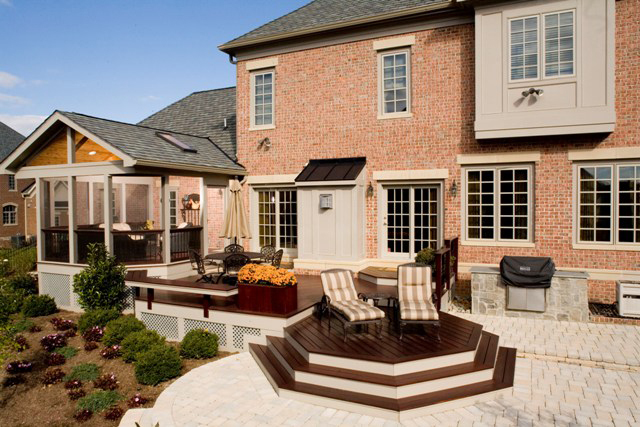 Just as we have done for many other homeowners in the Howard and Montgomery county areas, Archadeck of Central Maryland and Montgomery County can custom design and construct the conversion of your existing outdoor living space. We have extensive experience transforming decks-to-screened porches, creating an outdoor living area which allows you to enjoy the fresh air and wonderful view of your beautiful backyard while being shielded from the elements. 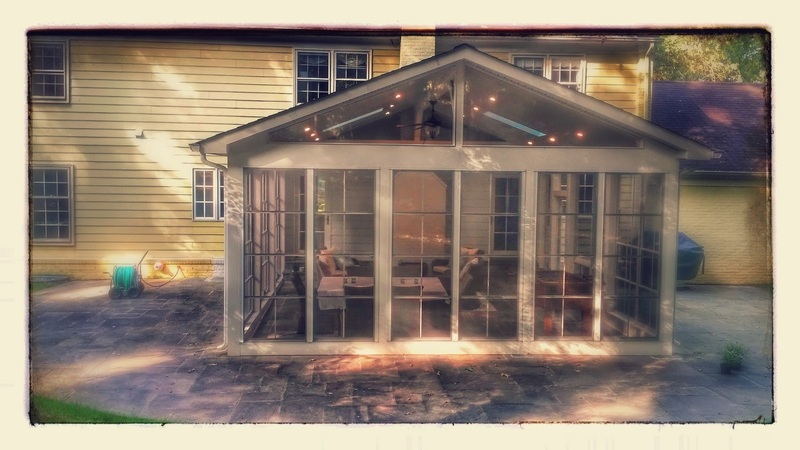 Additionally, we specialize in screened porch-to-sunroom conversions, producing outdoor room additions which blend seamlessly with your home and landscape to meet or exceed your outdoor living needs. 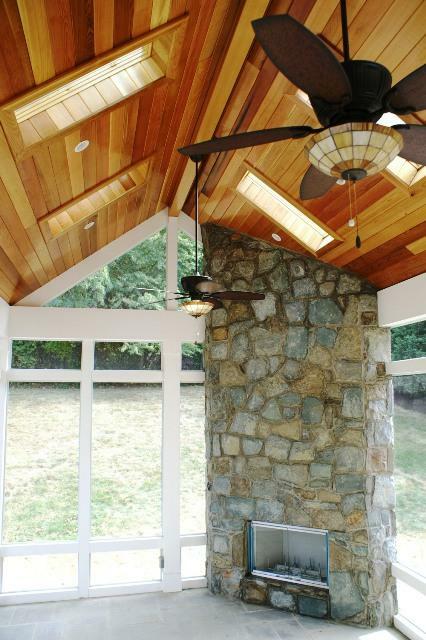 Vaulted ceilings and Velux skylights open up this gorgeous bright and airy screened porch in Rockville,MD. 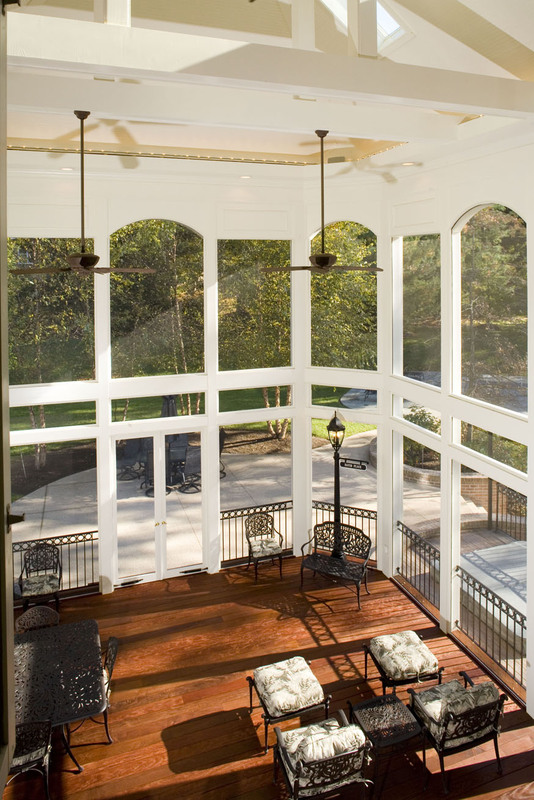 Though deck-to-screened-porch conversion or screened porch-to-sunroom conversions may seem like difficult projects, in many cases they are not. 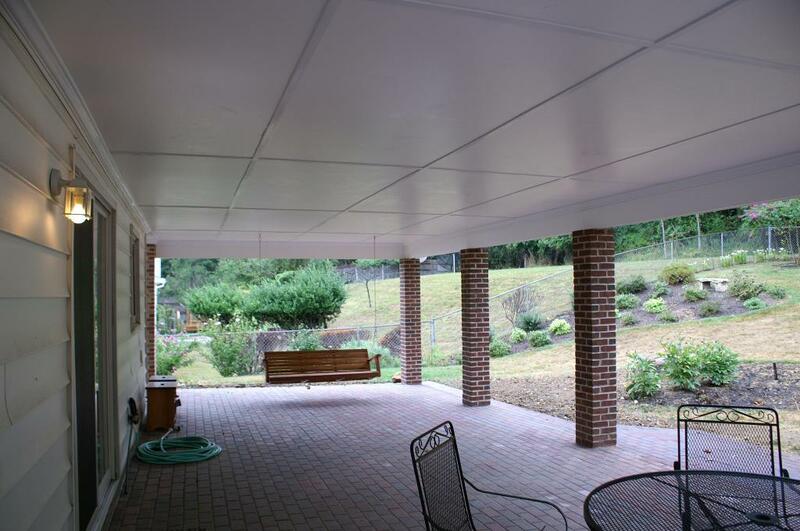 Prior to beginning either of these projects, we begin with an evaluation of the structural components of your existing deck or screened porch. A good majority of these existing structures, if not built by Archadeck, may not have been constructed to support the weight of a roof. Other elements we inspect and take note of during the onsite evaluation include: the method in which the deck or screened porch was originally built and the type of foundation and joists the structure has. Full knowledge of these items are part of the criteria that must be met to ensure your existing deck or screened porch can support the added weight of a roof and the additional standards required in making the conversion. In most cases, conversions are possible, but it is crucial to hire an outdoor structure professional with extensive knowledge about decks and outdoor structures. Hiring a professional ensures the safety and success of your intended conversion. 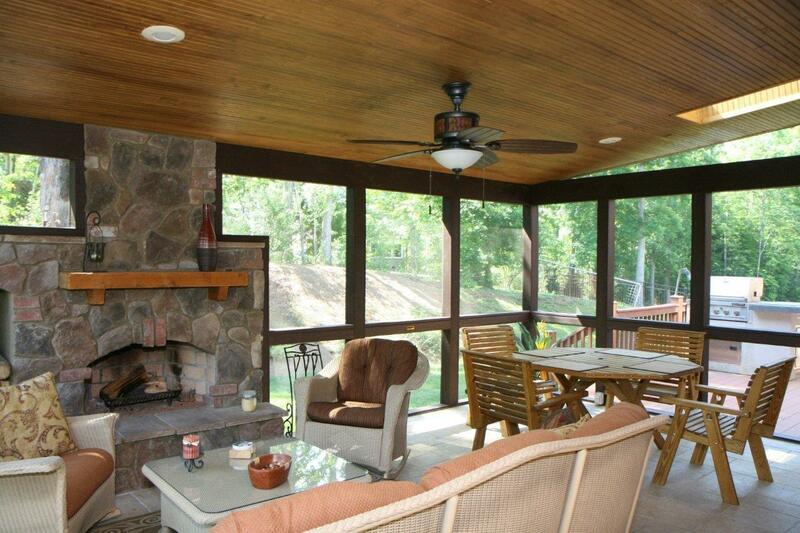 Versatile screened porch and deck combination in Central MD. As your outdoor structure professional, we highly recommend reinforcing any existing structure’s foundation when converting it to a roofed structure. We can retrofit most existing structures by installing new footers (as long as we can get underneath the structure to reinforce it), which reach all the way to the corners of the structure, to support the new weight of a roof. 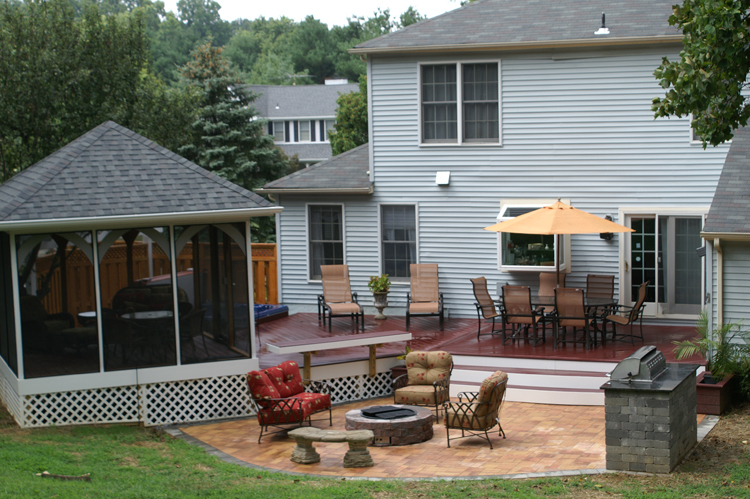 If you are considering a conversion or upgrade for your existing outdoor living space, contact Archadeck of Central Maryland and Montgomery County today. We’ll not only inspect the structural soundness of your existing deck or screened porch and determine if it’s a candidate for an upgrade, we’ll also custom design and build your new converted structure to bring added function and beauty to your backyard and lifestyle. 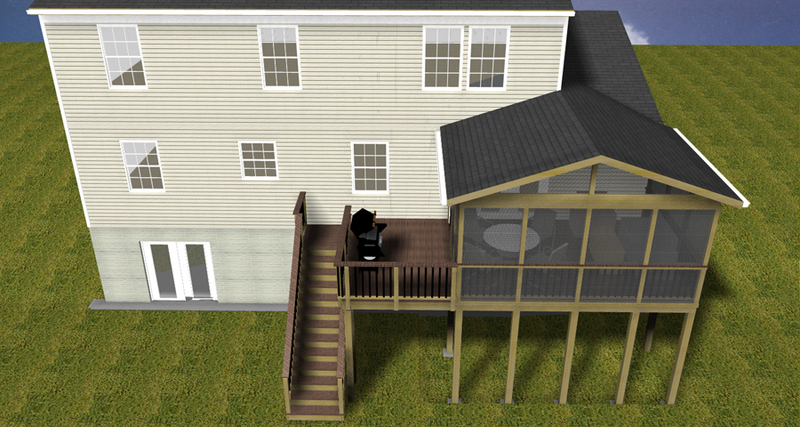 Call us for a free design consultation, or to schedule a deck inspection today at (301) 926 – 3001 or via email at centralmaryland@archadeck.net. Explore the benefits of working with a experienced, upscale builder that builds year round! Would you trust your dreams to a cut-rate builder? 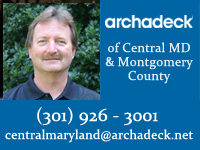 Archadeck of Central Maryland and Archadeck of Montgomery County offer homeowners peace of mind that their dreams will become a reality. Imagine dreaming, planning and saving to build your outdoor structure. Imagine hiring what you think is a reputable builder to bring your dream patio, screened porch or deck to fruition, only to have the builder walk off the job with your structure half completed, never to return. Unfortunately, this scenario is becoming more and more common among the building industry. Now more than ever it is important for consumers to learn the true meaning of what it means when a builder is licensed and insured, which safeguards the homeowner from having this type of travesty from happening to you. 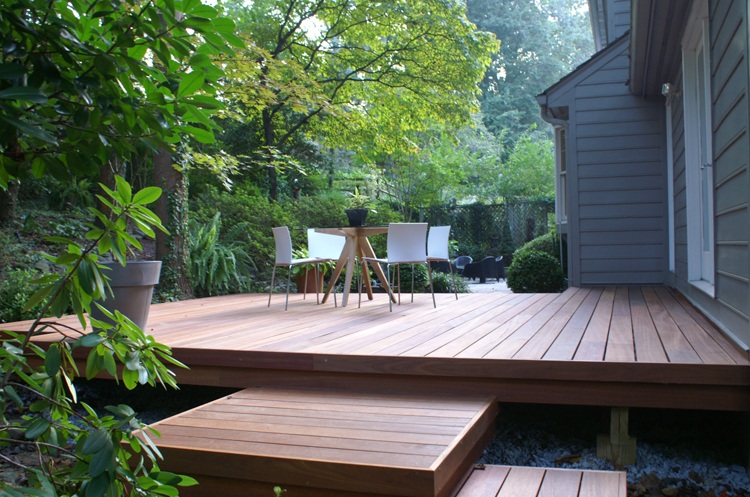 I recently had a call from Bel Air, MD where a homeowner had a contractor start a deck for her over a year ago. The contractor was a reputable builder that had been in business in her market for many years. The contractor then went “belly up” as a result of the recession. The builder had references and a good reputation, and the homeowner felt the builder she had hired did good work until her deck was halfway completed and the builder went out of business. The homeowner then had no protection because the builder’s insurance did not cover guaranteeing her deck would get 100% finished. Archadeck of Central Maryland went in and picked up the pieces and finished the homeowners deck to her complete satisfaction. 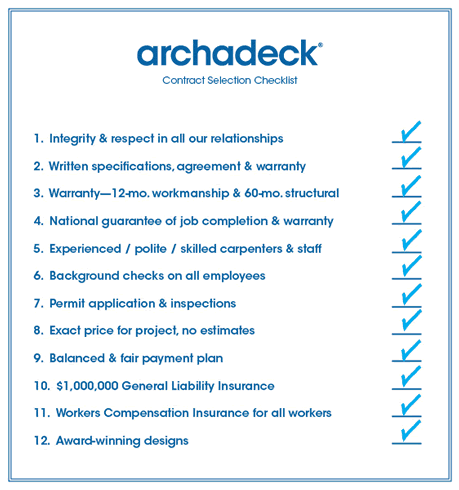 Had she went with a company such as Archadeck from the beginning, this ordeal would have never happened because we are licensed and insured with Archadeck’s own National Guarantee Corporation which gives the homeowner a performance guarantee with no additional cost to homeowner. The frequency of these occurrences and scope of the problem is being felt nationwide according to national statistics. According to recent data the 18 month recession which began in 2007 and formally ended in 2009 represents the longest economic downturn America has experienced since World War II. The NBEA, ( National Bureau of Economic Analysis) has noted that the economic recovery actually began in 2009, and they also noted that as of yet the economy has not returned to normal capacity. Among the hardest hit during this economic downturn are the contractors that make their living in various trades of building. From commercial to residential building, contractors are competing for less work and their failure rates are rising sharply. Some of the hardest hit are the “fly by night”, unlicensed and uninsured contractors. All over the country the failure rates for contractors that are not adequately licensed, permitted or insured are extremely high. The failure rate is impacting the entire genre of building as a whole. From bankruptcies and foreclosures, the wave of failure rates can be felt all the way down to the consumer, leaving unfinished structures and shattered dreams in their path. This two-story screened porch by Archadeck of Central Maryland and Montgomery County is an example of our excellence in design, quality with guarantees to match. This cannot happen when you choose to hire Archadeck of Central Maryland and Archadeck of Montgomery County to build your structure. 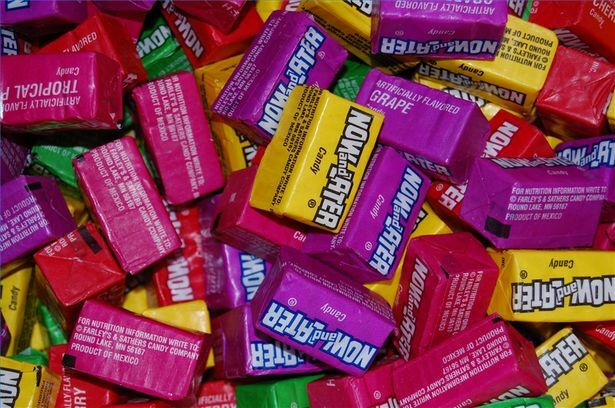 We not only enjoy the benefit of being part of a national company that’s nearly 25 years old. But, we have an unprecedented guarantee in the business. We GUARANTEE that your project will be finished. Even if the unforeseen were to happen like someone in the family falls ill or I get stuck in Saskatchewan and can’t get back, someone else will step in from Archadeck and finish your job. We know that things happen. We’ve seen it happen everywhere in this recession. But you can have the most peace of mind with Archadeck. We are a fully funded corporation, guaranteed – I have been the chairman of the board for two of my last six years on the board and I am still board member. Not one single customer has been left holding the bag in the six years that we’ve had the corporation. We offer protection for homeowners that no other contractor can provide and ensures project completion. Our guarantee also includes a two-year structural guarantee and a one year workmanship and material guarantee. This is why we call our warranties a “performance guarantee”. We also have million dollar liability protection and all of our worker’s are covered by workman’s compensation which means that if a worker gets hurt while working on your structure, you are not held liable for any injuries or medical bills that may incur from an accident or injury. 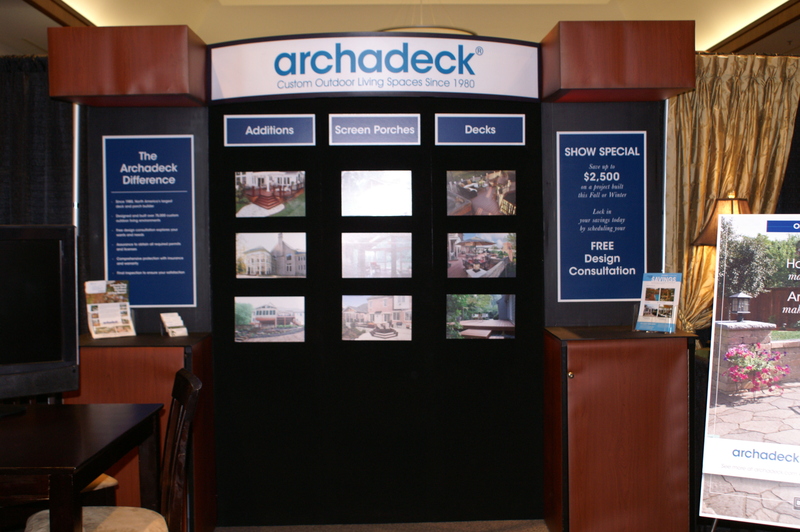 If you are ready to turn that dream of an outdoor structure into a reality in your own backyard by a builder that will stick by you through thick and thin and see that your outdoor structure comes to completion in all it’s glory, contact Archadeck of Central Maryland or Archadeck of Montgomery County today to learn more. 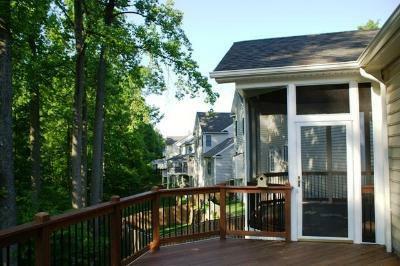 Columbia MD deck gets transformed into a screen porch. 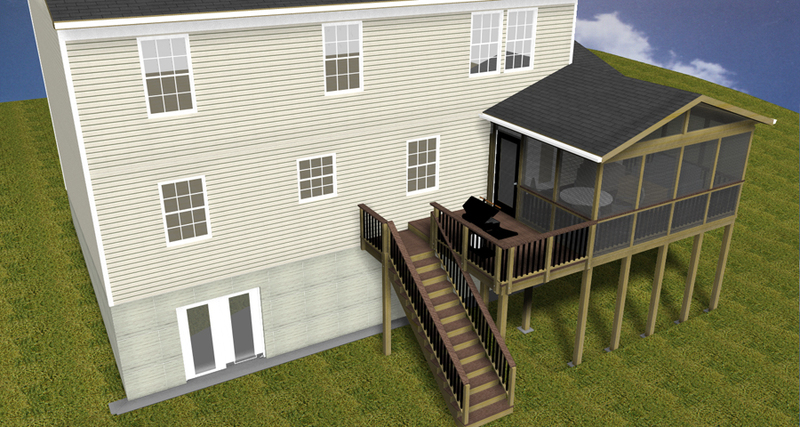 Can your deck be transformed into a screen porch? This design rendering shows what the anticipated completed Columbia, MD structure will look like. Who doesn’t love spending time on their deck? Decks are great for entertaining, grilling out and soaking in the sun. However decks are “time sensitive”, meaning when the winds grow colder, or the autumn showers come to call you are deprived of many hours of enjoyment if a deck is your sole outdoor structure. One Columbia, MD porch builder is changing the way we look at decks by taking a portion of your deck, and in some cases the whole area, and turning it into an enclosed, insect free, rain-friendly haven screened porch or 3-season porch where you can welcome the beauty of the changing seasons without the harshness of the elements. This image shows the Columbia, MD deck before Archadeck of Maryland began the transformation. That’s right. If your deck’s foundation is built to support a roof, you can covert all or a portion of your deck into a screen porch, open porch or enclosed room with a minimal amount of fuss. 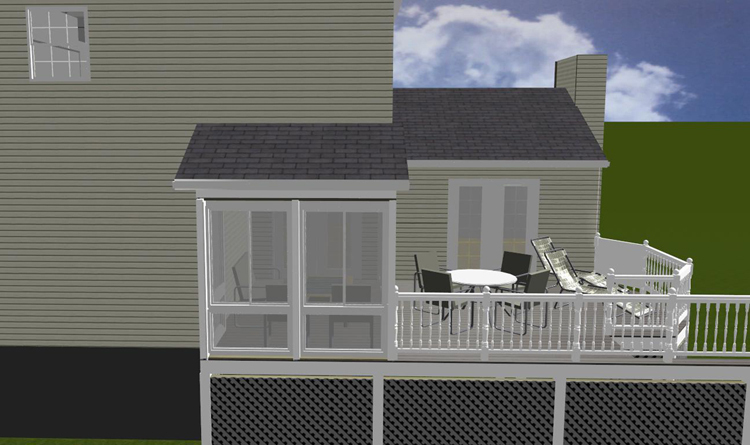 In this story Archadeck of Montgomery County and Archadeck of Central Maryland is converting a section of this Columbia, MD homeowners deck into a screen porch. 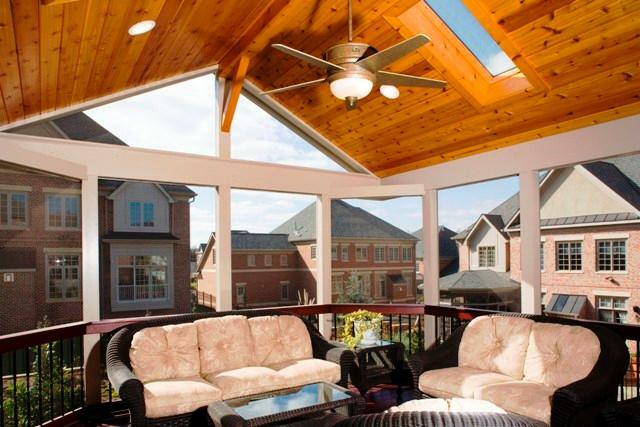 We also go a step beyond a screened porch by using a convertible enclosure system that will extend this Columbia, MD homeowners enjoyment and use time well into the colder months. This "before" photo shows the area where Archadeck of Maryland will be extending the overhang to accommodate the screen porch. This “in progress” transformation in Columbia, MD is proof positive that a screen porch doesn’t just need to be a screen porch. This particular deck is located under the 2nd story overhang. We are expanding the overhang to accommodate the new living space and we will also be installing an accordion style folding screen door that will completely open up the area. In another portion we are going to be using an Artistic Enclosures system with sliding windows that also open completely. The homeowner wanted the enclosure to have the capability of being removable and also sliding. This is accomplished using the ScreenPlus contemporary system we are using to define the new space. This area will encompass the new Columbia, MD screened / enclosed porch. Once completed this Columbia, MD home will have the capability for enjoyment for 3 if not 4 seasons. The combination of outdoor structures will also be conducive to entertaining on a grander scale with areas for conversation, dining or whatever these homeowners have in mind. 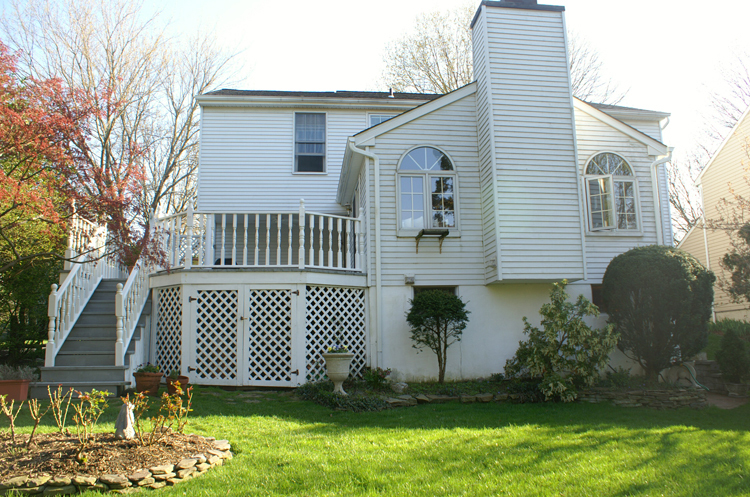 This "before" photo shows the side of the Columbia, MD home prior to Archadeck of Maryland starting construction. You may ask ” is my deck able to be transformed in the same manner”? And, the answer lies within your deck’s structure itself. 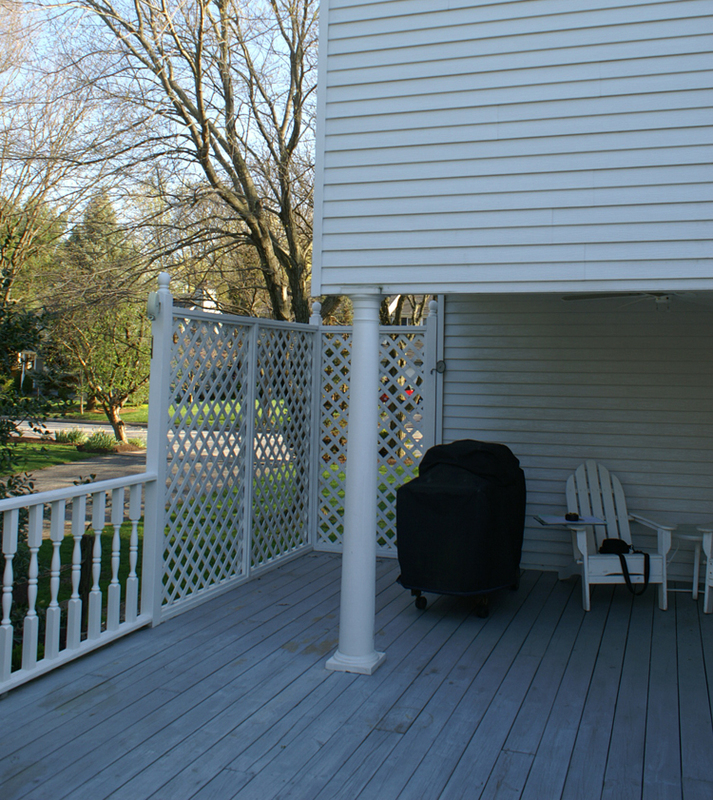 Archadeck of Central Maryland and Archadeck of Montgomery County discusses the idea of converting your deck into a screen porch, or enclosed porch and gives valuable insight and technical advice on doing this at your home. 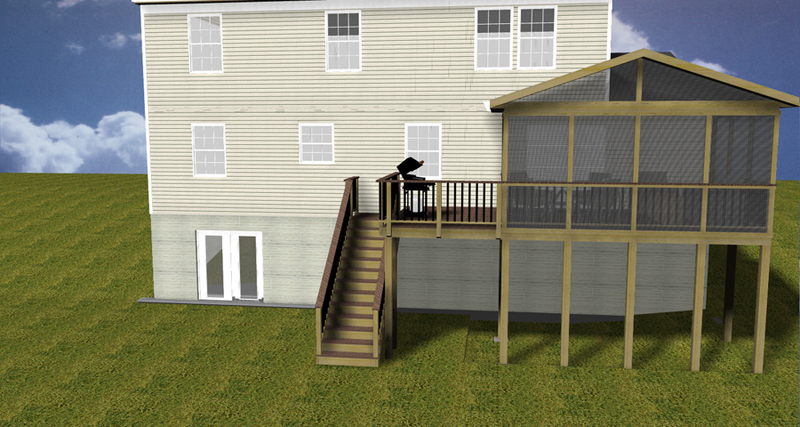 Design rendering showing view from the side upon completion of Columbia, MD structure. You may be able to convert with minimal effort, but in many cases the foundation will have to reinforced. In a screen porch scenario for example, you must have the capability to support the perimeter because that is where all the snow loading and roof load areas come into play. In this situation we will need to add footings at the perimeters where the walls attach. If your original deck was a permitted project to begin with, then there is a possibility that you won’t need additional foundation reinforcement. A licensed, custom builder will be able to address any foundation concerns before you begin your conversion. If you are building onto a deck that has decking boards that have gaps, then we install screen under the structure to keep insects out and may install skirting around it as well. When building a porch from the ground up and making it convertible, you will probably want to choose a flooring which contains no gaps. You also want to choose a material that ensures your boards won’t succumb to cupping, this is important when considering a lower grade material. Ventilation is also important when choosing your flooring material. This alternate view shows the completed structure in all its glory. This outdoor space has it all, a screened gazebo, fire pit and grill area all of which can add the utmost enjoyment during the fall months. Fall comes into our lives each year like a daydream with visions of crimson and amber leaves set adrift on a fall wind, and the pleasant feeling of acorns falling from majestic oaks that play party to scampering chipmunks and squirrels. As one of the most dramatic seasons, autumn is best enjoyed as a front row spectator. The aromas, the mild temperatures and above all the flurry of colors can serve as an inspiration to your daily life from your very own outdoor structure. 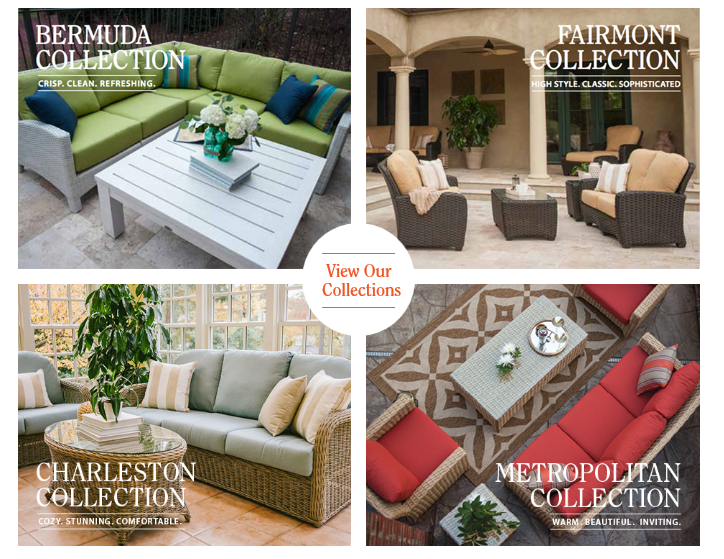 Imagine curling up on your chaise lounge with your favorite throw while enjoying a cup of chai tea and witnessing the magic of the season up close and personal from your new screened porch. This scene is delicious, especially when you are flipping through a current issue of your favorite home and garden magazine and realizing the images within the pages don’t hold a candle to the beauty that is present in your very own backyard from your stunning custom outdoor structure with mother nature’s imagery as your backdrop. 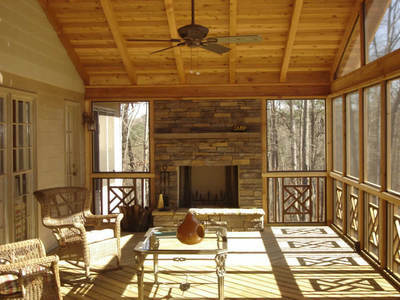 This screened porch by Archadeck of Maryland offers a vantage point to watch the leaves change. Imagine the amount of fun and family memories that can be made in the fall while making smore’s on your very own outdoor fireplace or fire pit. The cool breezes, the warm enticing glow of the fire and the warmth of your loved ones around you. Fall is the perfect season to build your outdoor structure for many reasons, we have broken these reasons into a list of the top 5 to serve as much for inspiration as for guidance. #1) There is still time to enjoy– There is still plenty of time to enjoy your new structure this season. The upcoming weeks still hold the promise of nice enough weather to be able to enjoy your new structure. #2) A front row seat to fall– The leaves in some areas are just now getting their tinges of fall color, with many weeks of beauty that lie ahead. Wouldn’t you rather see the season unfold from the comfort of your outdoor structure as opposed to looking at it from a window in your home. Fall is the definitely the prettiest time of the year to build. #3) Get in on the savings– Undoubtedly, prices on low maintenance building materials are destined to go up again in 2012. Indeed they go up at the beginning of each year. If you start your construction in the fall, you will have the edge on saving money because you will have begun before prices rise again in the upcoming new year. #4) Avoid the rush– You can avoid the rush on building during the spring when everyone else decides to get things started. In the fall there is not a long waiting period to begin your project, and come spring you will be “sitting pretty” in your completed structure, while everyone else is still waiting to begin construction on theirs. #5) Stop and smell the flowers– Many seasonal perennials can be damaged when the soil around them is disturbed during the extreme cold of winter or the excessive heat and humidity of summer. Uprooting or disturbing the soil and roots of plants like Rhododendrons and Azaleas which are commonly used as foundation plantings can damage the plant and leave the plant susceptible to disease, fungus and insects. An outdoor fireplace used within a screened porch can add warmth as well as offer an intimate setting for chilly autumn nights. Another great benefit of building your outdoor structure in the fall is being able to take advantage of all those end of-season discounts on accoutrements and accessories for your outdoor space such as outdoor furniture, grills and decorative items. Autumn is the time for deep discounts on these items and can give you the ability to stretch your dollar further than if you were purchasing these items in peak season. 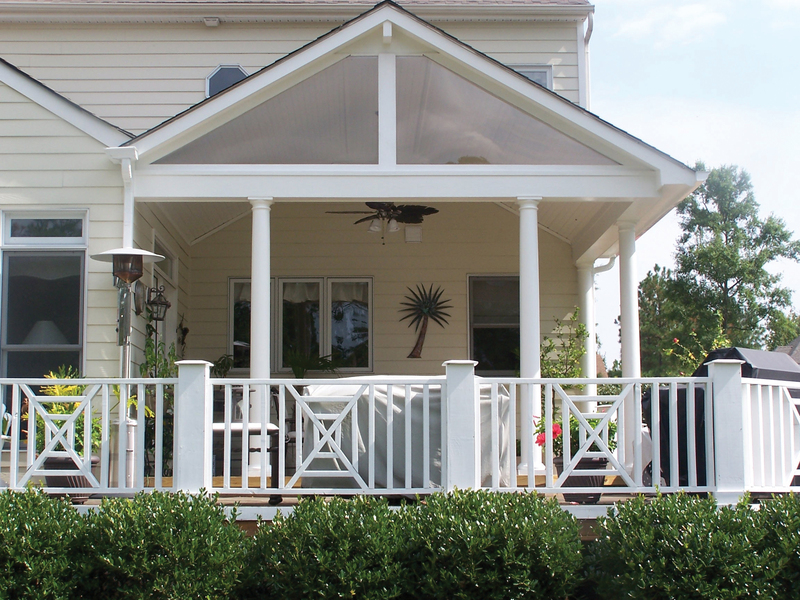 Top 10 considerations when building a porch. 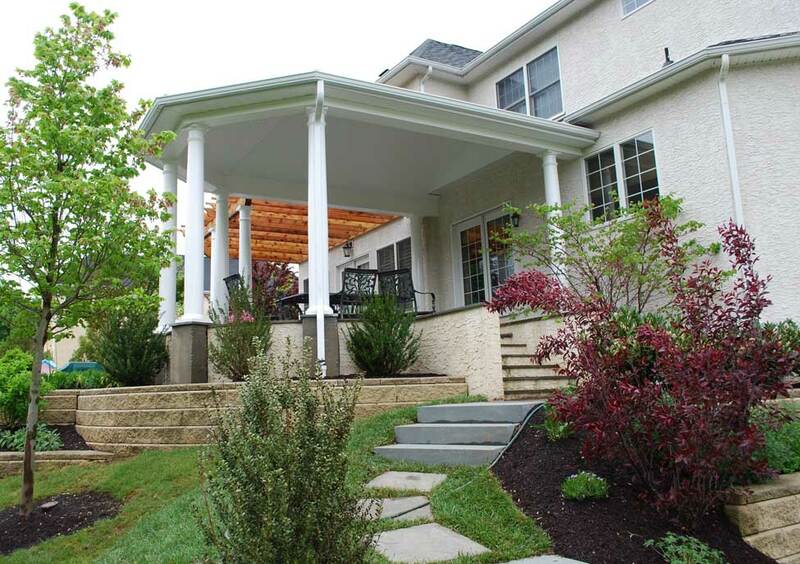 This screened porch by Archadeck of Central Maryland and Montgomery County boasts two levels of beauty and quality. When making the decision to build an outdoor structure, or outdoor room there are many things to take into considerations. Making the right decisions early on in the process cannot only ensure your outdoor structure compliments your home and landscape, but it can also improve your lifestyle and add value to your property. And above all, it can impact your state of mind. Archadeck of Central Maryland and Archadeck of Montgomery County pride ourselves in planning, designing and building outdoor structures that really make a difference in how you live. One such structure that is sure to add beauty and enjoyment to your life is a porch. Porches can be covered or uncovered; attached to your home, patio or deck; or even detached in a prime location within your landscape. We have compiled a list of the top ten considerations to think of in the planning stage when building the porch of your dreams. This screened porch by Archadeck of Central Maryland and Montgomery County utilizes a fireplace for function and aesthetic appeal. 1) What function would you be performing in your porch? This by far is the first and foremost question to take into consideration as it dictates where the porch itself should be located, whether it will be detached or attached and what amenities it will need to include. Usually porches serve as either an extended outdoor family room, or an outdoor dining area, or a combination of both. If it will serve as an outdoor dining space, the porch’s proximity to your home’s kitchen is very important. If you are going to use the porch to function as an outdoor family room, then the proximity to the kitchen is not a big issue. You also need to consider how you want to utilize your space once the seasons change. If you want to make use of your space within the cooler months of the year you may consider building a convertible Artistic Enclosures porch, which uses wall systems to enhance your space from season to season, or Eze breeze by PGT , which uses a screen plus a sliding 4-track convertible system. If you want your porch to serve as an extension of the home because of a lack of indoor living space, you can make the porch a convertible space with windows that can be removed during the warm months, but serve your needs for an enclosed, heated space during the winter months as well. This Maryland covered porch offers easy access to and from the kitchen. 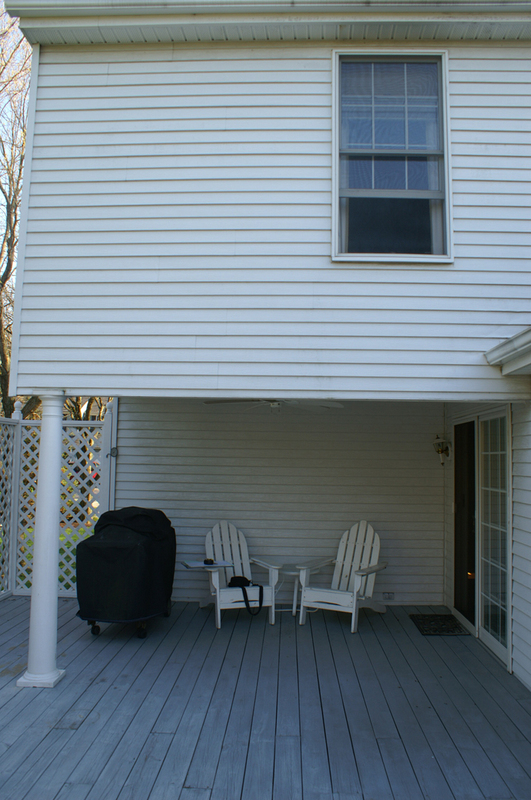 2) How high off the ground should your porch be? This is something most homeowners don’t consider but is a crucial element when thinking of building your porch. 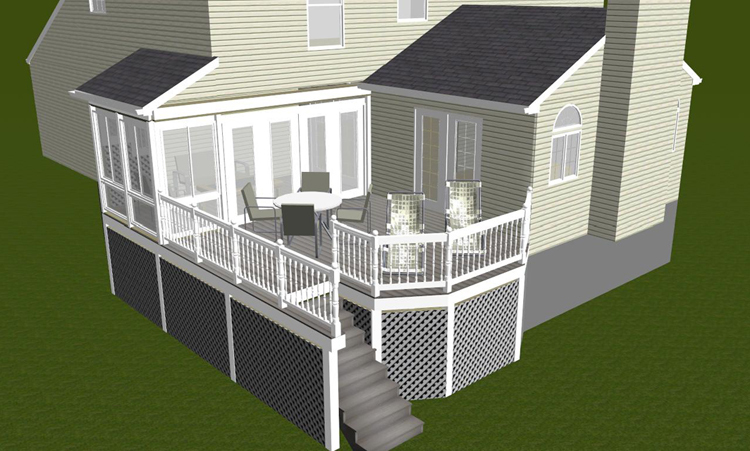 If the space between your porch and the area it is intended to work with are too far away or create an inconvenience to move between areas, then chances are that you will not only regret your configuration but may stop using the room altogether for the purpose which it was initially intended. 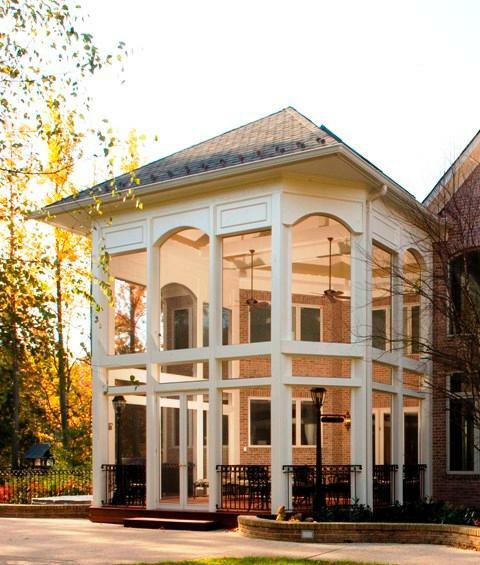 This two-story screened porch by Archadeck of Central Maryland and Montgomery County utilizes a large area for dining and a large area for entertaining. 3) How large should your porch be? Deciding what size porch you really need will impact how you use your porch throughout it’s lifetime. You need to figure out how many people are going to be using it and what function they will be using it for. I actually often recommend that my customers build a smaller porch than they were originally intending. Here’s the reason. If you envision having a porch span the entire width of the back of your home, that may be much more space than you need and can even cause the room to lose its cozy appeal. Think of a home that has a very large room that goes from the front to the back of the home or from one side of the home clear to the other side. Often times these large rectangular rooms are hard to decorate and cause the room to be much less cozy. Now if your intention is for your porch to really serve the purpose of being two distinct rooms, then it might make sense. Let’s say that you want to use one side of your porch as an outdoor dining area and that part of the porch opens up into or very close to the kitchen. Then you may want to use the other side as a living room sort of area and that side opens up into your living area in the home. Then, that’s a really good use of a long rectangular space. A good all around size for a porch that is designed for one living space is generally a 16×16 or 16×18. If you are still unsure, then measure your home’s living or family room. Do make sure to take into consideration the space needed when the items are pulled out. For example, consider how much space is needed around your table when everyone is sitting back after a large meal. People generally pull their chairs out from the table. Will there still be room and foot room within the structure with the planned furnishings? When making your final decision build for the 90%, not the 10%. Even though you don’t want to build more space than you have, not having enough room is a greater dilemma than having a little too much as you can’t just add a few feet to a porch the way you might be able to do with a deck or patio. 4) Screen anyone? 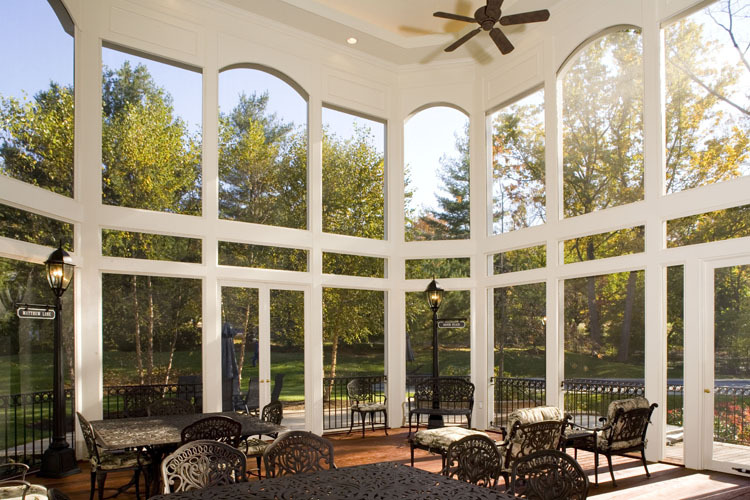 If you are choosing a screened porch, then your screening system and type of screen you choose is very important. If your goal is to really enjoy the view of your back yard, try using a screen system that is as invisible as possible. Here are some situations that may require a stronger screen system. Might your screen come in contact with falling tree branches or limbs, birds, cats, or even hockey sticks? Screen comes in many different types to accommodate your individual needs. Durable screens, such as Super Screen which offers a 10 year warranty is recommended for people with dogs and cats. Privacy screens are also available which are a more opaque screening material and appear almost invisible. You can even use exterior grade shades, like roman shades for example. 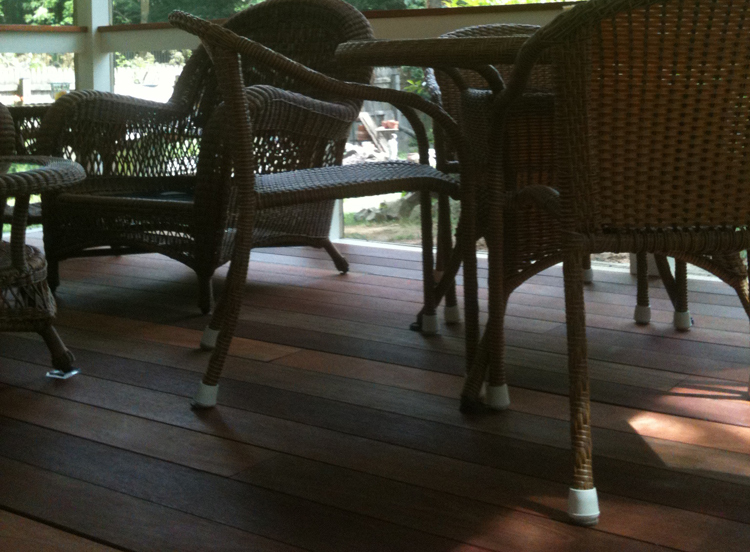 This porch in Bethseda, MD shows how beautiful a mahogany floor can be when used on a porch. 5) Flooring options. Your porch’s flooring is front and center so choosing a flooring material that appeals to your eye is important. In most cases, your porch will offer some protection from the elements so you have more flexibility when it comes to your flooring than you would on other outdoor structures, such as your deck. If a natural look of wood is your style, woods such a mahogany and tigerwood are popular to use on porches. Some people use stone and tile, which can be pretty but can also be very problematic. The grouting used in stone and tile will eventually crack with the cold and freezing weather conditions we have here in MD. These materials also are cold to the touch, and that also means to the feet. Another choice is a tongue and groove composite. They are long-lasting, and offer beauty and little maintenance. 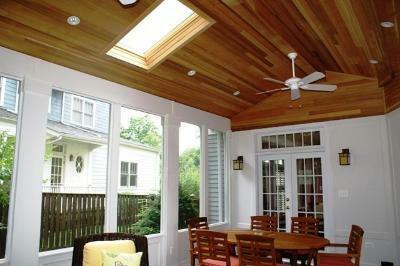 This screened porch ceiling was finished with beautiful cedar. 6) Coming out on top? This would be your ceiling material choice. In most scenarios your ceiling material will not become a maintenance issue. Ceiling materials that are popular right now amongst porches are beadboard, and tongue-and-groove pine or cedar. These all offer a touch of rustic elegance to your structure. Skylights are a viable option in darker landscapes that need additional light in the structure or the home. Skylights can be used on any porch which is well lit, or otherwise. But most homeowners with ample light often don’t choose them because of the additional cost. Velux makes a wonderful Low-E skylight. Skylights can also come with a range of features including rain sensors which will close the skylight, remote controls and even blinds built right into the skylight. 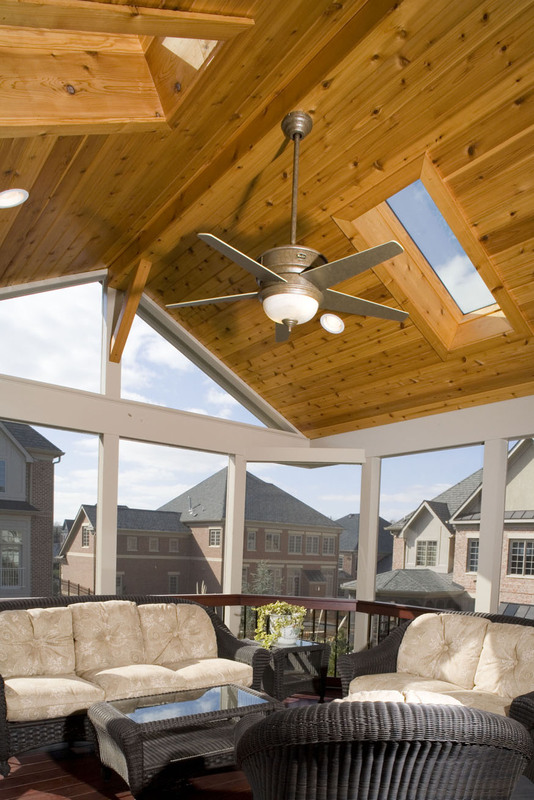 Plenty of lighting and ceiling fans can enhance the enjoyment on your porch. 7) Really think about your lighting and electrical needs. It is important to think about this up front. Most people who build a porch consider it their favorite room and are filled with regret that they didn’t build it years before they did. Remember, it is always better to put in too may electrical outlets, than too little. The cost to add outlets in the building process is minimal. 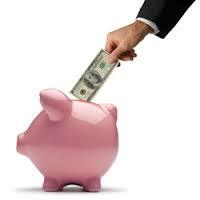 The cost to add outlets after building is complete can be very substantial. Think about having outlets to plug in both floor lamps and table lamps. You will likely want an outlet to charge your phone and other to charge your laptop. You will use other electronics such as your television. Depending on the use of the room, you may even want to plug in a blender for margaritas or other kitchen apparatus as well. Lighting comes in three different formats- table and floor, fan package, and ceiling fixtures. If you desire lighting in the ceiling, you should go with covering the rafters as opposed to leaving them exposed. With recessed lighting you can hide the wire more easily. You can also easily add insulation if you have a covered rafter. 8) Exterior materials. Maintenance free, formal and finished, or rustic and natural? 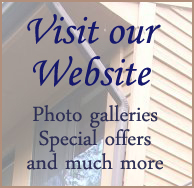 There are lots of exterior material choices available for porches. 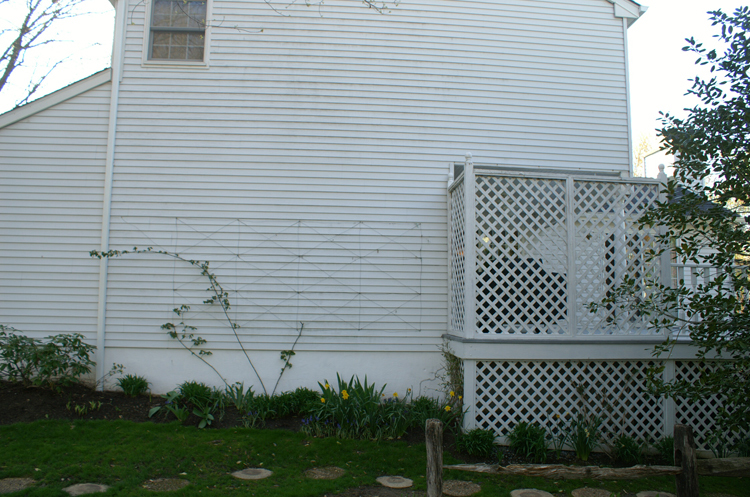 Many times we trim the exterior using vinyl because aside from minimal cleaning, it is virtually maintenance free. 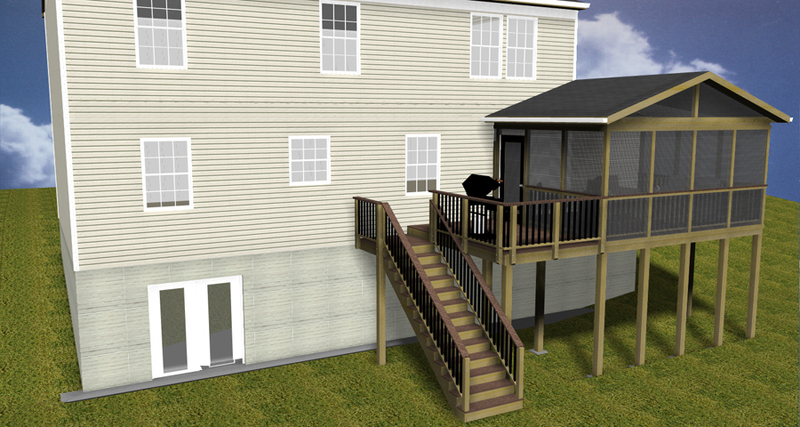 Based on the elevation of your structure you may or may not need railing or a kneewall. Not having a lot of additional areas to cover will cut down on costs and will give you more light and airflow. 9) Welcome! The style of door you choose is extremely important within your structure. We have customers that stick to wood, but they are few. Most of our homeowners use storm doors. Storm doors are light when they have screen in them. Choosing a good quality storm door may or may not be that much more costly than using a wood door. It will give you more protection from the elements and can also be safer from a security perspective because of its strength. 10) Style of roof. Gabled roofs are quite popular amongst our porch customers. However if you are building gables, you will need to make sure it works with the windows above. There are other roof styles available that may harmonize better with your residence. If building a detached porch, you may or may not choose to match the structures roof to your home’s roof, many times a different style roof on a detached porch compliments the property better than a matching roof. Archadeck of Central Maryland and Archadeck of Montgomery County can help you when deciding all the basics of building your porch. We can meet with you and discuss all the options and what will work best for your particular circumstances. This is the fun stuff for us. Building an outdoor structure is a personal thing. How do you translate your ideas to design? As a homeowner deciding what type of outdoor structure to build can be a difficult undertaking. Especially when you are starting from a blank canvas. How do you even begin to decide what outdoor structure you want or what you would like the design to be? Most “run of the mill” cookie cutter builders want to enter into the job with all the decisions already laid out for them so all they have to do is go in and build what they are told to build, collect their money and get out as quickly as they can. Building is an interactive process. That is why it is important for you to hire a custom outdoor structures builder. Any building that includes living spaces, whether it is an indoor living space or an outdoor living space is a very personal thing. The decisions you make as far as design and materials can impact your life and the life of your family for years to come. That is why it is important to get it right the first time. It is important to use a builder whose skill set will translate into your needs. A good builder will have the insight, experience and knowledge to listen to you and help translate your needs and wants into a design and a structure that are right for you and your family. I enjoy meeting with the homeowner and talking with them about what kinds of activities they want their outdoor structure to facilitate for them. I look over any pictures they have collected or any ideas they have compiled and integrate all these things into a design rendering of their outdoor structure. The design renderings can really speak to you in a way nothing else can. Homeowners find them extremely valuable in deciding upon a certain outdoor structure. The rendering is very realistic and shows details not visible through an average one-dimensional black and white sketch. This realism gives you the ability to make changes and additions to the structure to better suit their needs before construction begins. It is a truly “custom” feature that has proved invaluable in communicating with the homeowner. Most companies do not provide a design rendering. Being able to understand the homeowners needs, likes and style choices goes such much further than just being able to compliment their outdoor living environment. I like to understand what it unique about each homeowner’s taste and preferences so that I may design an outdoor structure as individual as you are and encompassing as many elements of your personal taste and style that I can. When you are planning your ideal outdoor structure it is crucial to think about using the structure every other day, not just on a “special” day, or for special events. You want your outdoor structure to be an expression of you and an extension of your living area. I like to meet with each homeowner to discuss the myriad of design choices they have available as well, choices like materials, styles and colors can really help turn their outdoor structure into an extension of their own personalities. I am very passionate about getting to know my customer as well as their likes and needs. My main goal is to help guide them through the process from beginning to end, and end up with an outdoor structure they love.